Sceneries of rounded hills can be seen through the large windows of the carriage. We now pass the Atlantic side of the Pyrénées. And my eyes now wander on the pages of a paper companion of mine, The Storyteller by Walter Benjamin. 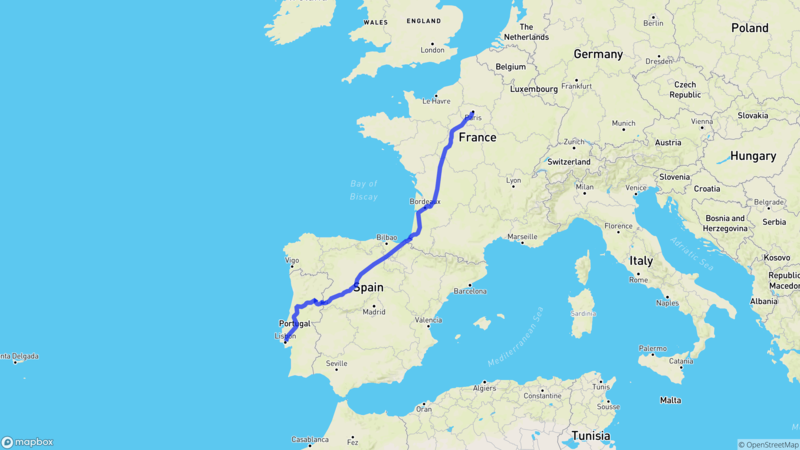 As boarding on a twenty hours train journey was not unusual enough, I also decided to carry my bike over this 2000km journey between Paris and Azenhas do Mar – a little town a bit far of Lisbon and Sintra, in Portugal. Today we are Sunday June 18th 2017; the first Sunday of summer. The daylight will start to dim sooner and sooner every day. I woke up near Entroncamento. The train was still on the move between Irún and Lisbon, between the France/Spain border and the western edge of Europe. I boarded on this journey thanks to Béatrice. Béa, one day you told me about your train journey from Bordeaux to Lisbon. "Just" for the week-end. I did not understand why you spent more time on a train rather than visiting the final destination itself. But I understood you loved it. This entire experience. You even wrote a song out of it, Railroad Club. About your need to feel true to yourself and to take the one last night train to Santa Apolonia. It was a while ago but I wanted to meet with your song. To experience your long-winded tale. To twist it by travelling with a bicycle. To see if a long intercontinental journey by train was nicer than a quick hop between two airplane runways. It seems obvious to me than a train trip would always be nicer over a plane one. It seems obvious than a 2.5 hours journey is shorter than a 20 hours one. And it would be natural to favour the shortest journey, the fastest one. I remember waiting on the platform of the Irún train station. The sun was heavily baking the pavement. And I have rarely seen such a large but deserted train station. It felt abnormal. Coach 20, seat 5B, by the window. A middle-aged man is waving over at his relatives through the window. I feel sympathy for him. Maybe we are both unaware of where we are really going. Another man is making attempts to take a perfect selfie. People would board in or step out as we stop in various train stations. Some of the city names sound familiar to me. A few peeps would smoke in between the carriages, thus infuriating the ticket controller. Other people would go and sit at the counter of the restaurant carriage. To have a sandwich. To enjoy a full course meal. To have some drinks and chat with their friends or someone they befriended earlier on. I remember witnessing a touring bike boarding the carriage at 11pm. It was not yet fully dark outside. The bike was followed by the tired but happy face of her owner. She later told me she started her journey in Germany a few weeks ago. She only stopped in this isolated town in Spain, thousands of kilometers away from her home in order to make it a bit quicker to visit her sister on time in Lisbon. The ticket controllers were in panic: she did not follow the rules. Nobody was atuned on what exactly the rules were supposed to be. She was asked to leave, in the middle of the night, in the middle of nowhere, no matter what. We managed to negotiate, by showing she was trying to respect the rules as much as possible. I also remember that woman who screamed and shouted in our carriage at 3am. Hailing at everybody. Pinching the buttocks of the ticket controller as he diligently requested some silence — indeed, we were secretly hoping to enjoy some silence too. This is when the puppy started to scream too. The lady and her son were kicked out at the next train station. I felt the painful flow of emotions of the young man-to-be, standing still on the platform, his right hand palm covering his face. The carriages claimed their motion back. I remember seeing some familiar things on the way back. The face of the barmen. The mountains. The wheat fields. Some train stations panels. A bright red coat. Some places I would like to visit. Some places I asked myself if I would live there some day. The sight of the ocean through San Sebastian high street. I remember nothing from a plane journey. Maybe some clouds, sometimes. The outbound journey was composed of several legs. 👍 Travelling with a bike is widely accepted as long as it is kept in a bike travel bag. 👎 I had to let the bike next to the carriage doors because no space was available. 😏 My IDTGV final destination was Hendaye but it happened that the front leading carriages were operated by another company. I sneaked in the front train to stop a handful kilometers down the line. 👎 Most of the journey planners overlook this tiny rail segment, making it hard to book the journey in one go. 👍 Kudos Rome2Rio to have shown me the truth! 👎 It is not nice to be threatened of being kicked out in the middle of a multi-leg trip. 👎 Because train controllers change during the trip (at the Spain/Portugal border), you have to convince them twice. 👎 Being told to book a ~100€ sleeper fare (+40€ minimum) "just" to carry a bike sounds like a very unreasonable alternative. 👍 An arrangement is possible based on your negociating skills. 👍 Travelling with a bike is totally okay. 👍 Travelling with a bike was okay. The bus driver was cooperative, I guess as long as there was enough space left for people to come in. This essay written by Walter Benjamin is short but gave me strong takeaways. Walter Benjamin is one of my favourite thinker and writer. I found these writings right at a moment I was thinking about the importance of shared experience and about the "learner/teacher" & "pull/push" patterns — I can't find a better translation of "sachant / apprenant" for now. Sharing an experience has a more potential to be remembered than theoretical content (bored at school? You know why now). Mostly because we can forget about ourselves, hook onto the story and relate to it with our feelings. Something that is deeply experienced can be shared and told again. This is something I really understood only this year about agile practices: the techniques you experience once and can be applied right after are the most valuable ones. A shared experience is transformative. When I attended Sud Web in May, I experienced the fishbowl technique. And I have been able to reuse it right after, both enjoying it and being reassured that talkative persons would not take over a group discussion. Being available, being able to listen and being able to onboard someone into something they have no idea how to get started is more transformative than mansplaining giving a bunch of advice. Just by showing it is doable, and even enjoyable. You can find more reading notes of the Storyteller — they are written in French though. Reading Notes is a new section over here I intend to develop as a way to share my notes in the margin of the books I read. They are living documents which will evolve over time as I make connections betweens thoughts and readings. Now I understand what you found in Santa Apolonia. You got your space, you got your time to think and came back with a tune to remember this experience for a very long time. This is a way for us to face ourselves, our fears; to look at them, to look into our own eyes, to view through our fears. Travelling with a bike can be a total mess. Most of the inconvenience is due to uneven bike facilities on board of the trains. Each service has a different communication (when they dare advertising bicycle informations — wink wink Renfe), different acceptance (bike bags, unpredictable carriage equipments) and different booking options: Renfe requires you to book an entire sleeper cabin (to bloody store a bike!) whereas you cannot even buy a complementary bike reservation on a TGV service beyond the initial booking. Speaking at Write the Docs in Prague will be a perfect excuse to (re)iterate an intercontinental journey. Only for fifteen hours this time but without a bike – crossing 5 countries would certainly be too much of a pain in the neck 😥.